1 pc. 3,56 EUR ea. from 3 pcs. 3,11 EUR ea. from 10 pcs. 2,70 EUR ea. from 20 pcs. 2,50 EUR ea. from 40 pcs. 2,32 EUR ea. 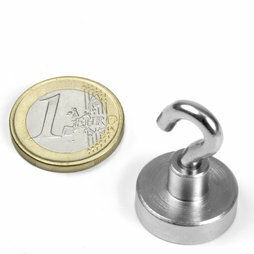 With these strong magnetic hooks, you can conveniently attach office and kitchen utensils, clothing, etc. to ferromagnetic surfaces. The full adhesive force of these magnetic hooks unfolds at the bottom side of thick steel beams, when the weight is applied downwards. 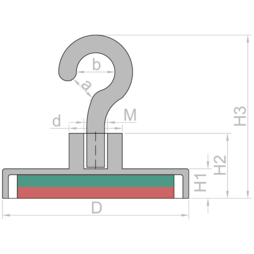 When attached to a wall, they can hold noticeably less weight (see FAQ about shear force). 5 pcs. 2,28 EUR ea. 1 pc. 4,69 EUR ea. 1 pc. 4,20 EUR ea. 1 pc. 20,73 EUR ea. 1 pc. 3,21 EUR ea. 10 pcs. 0,52 EUR ea. 10 pcs. 0,41 EUR ea.